Essex Fells, NJ is known for its quiet, unassuming beauty. Top notch schools and an easy commute to Manhattan make this an amazing hidden gem. The area is lush and wooded, with the much-loved pond and great hiking. House of Funk left its mark with interior design in a turn-of-the-century Colonial. I’ll dive into those details momentarily, but first, a little history on this town. Essex Fells was originally part of a territory known as Horseneck Tract that encompassed several neighboring towns such as the Caldwells, Fairfield, Verona, Cedar Grove, and more. By 1702, this Horseneck Tract had been purchased by settlers from a local Native American tribe. Most of the area’s homes are custom built and due to a 1928 ordinance, there are little to no traces of commercial buildings within the community, creating a unique residential oasis. Seventeen percent of the land is green space, giving the area a wonderful woodsy vibe. 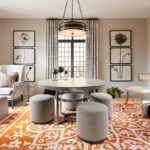 Essex Fells is known for its diversity in design styles, a factor that continues to attract residents to the area. Turn-of-the-century homes are soulful, historic, detailed, and rich in history, texture, warmth and hospitality. It was with great honor to design a foyer that truly exudes a warm welcome. 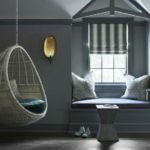 The space is chic and statement-making, all while retaining an easy vibe that flows through the rest of this gracious home. 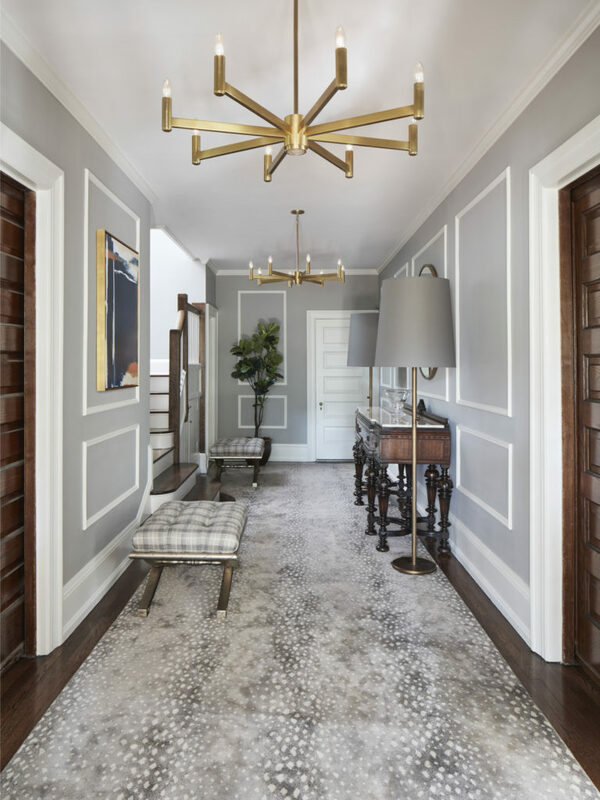 The home makes a striking first impression thanks to high-gloss paint by Benjamin Moore and modern brass light fixtures by Robert Abbey. 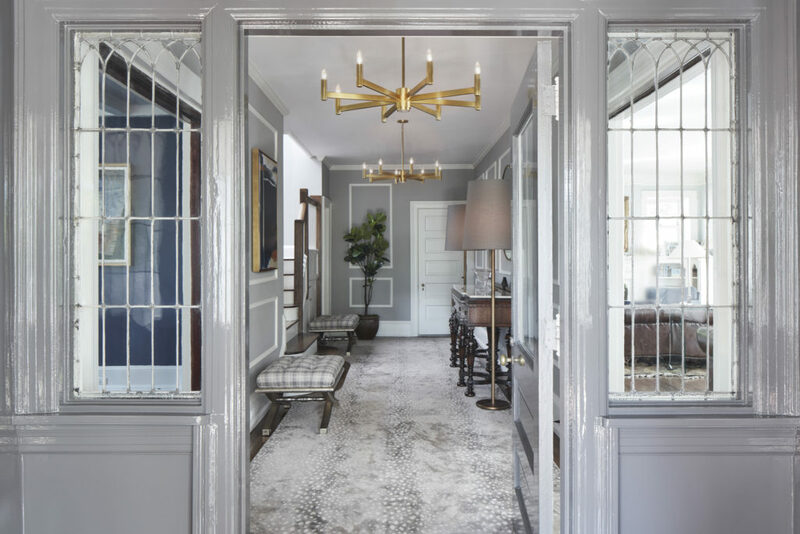 Sleek tones of gray are echoed throughout the entryway via a seriously stylish area rug, Vanguard ottomans, and Robert Abbey standing lamps. I kept the heirloom console table that the homeowners purchased with the house, only adding a honed marble top to make it more functional when entertaining. 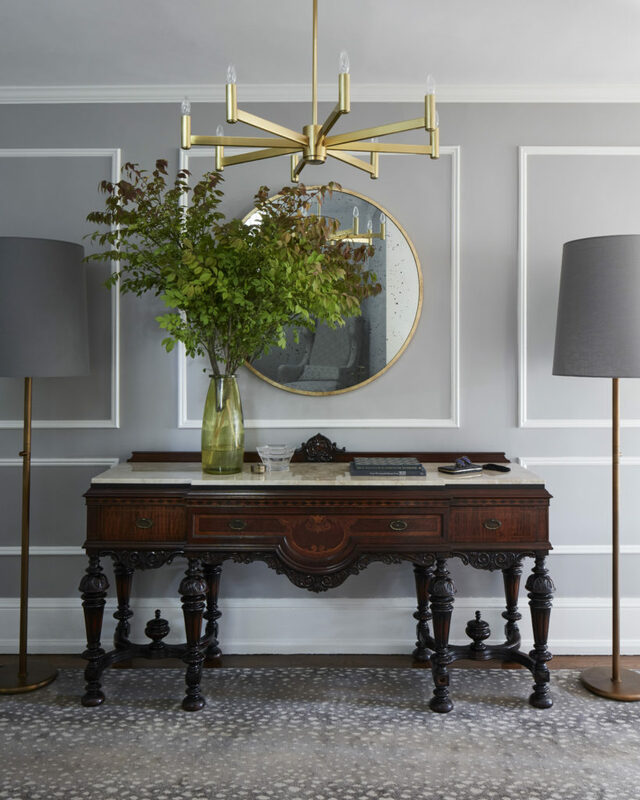 The space is streamlined and functional, yet refined, thanks to minimal accessories such as an Arteriors mirror rimmed in soft brass and pops of greenery. The cozy nook pictured above features a Vanguard armchair and an elegant brass side table. 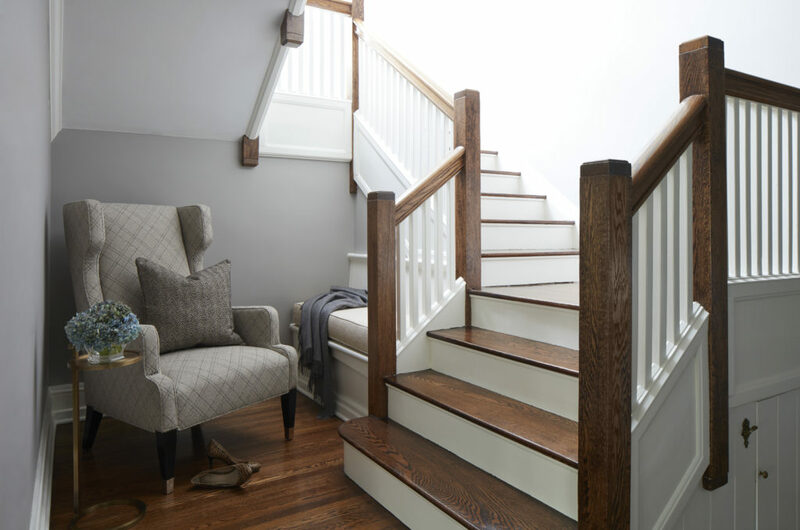 The seating adds much-needed softness to the staircase, and as anyone with toddlers knows, it’s not completely unrealistic to need a seat on the way up for the nightly bedtime routine. In all seriousness, this foyer gets its fair share of traffic when the family entertains, and any little spot to mix and mingle is welcome. Designing a foyer is an excellent opportunity to make a lasting impression. A home’s entryway is an essential part of the house, and one that sees high traffic. Investing in quality pieces, and mixing in personal touches is key to defining this space. But wait. There’s more…a sneak peek into another Essex Fells project, with more to come. The home pictured below is an English brick manor flanked by trees with a spacious backyard perfect for families. The interior features gorgeous oak floors and natural woodwork throughout, both of which lend warmth to this classic residence. Vintage crewel fabric wing chairs pull up next to an Oly resin cocktail table, my signature look of design that’s rooted in classics with updated clean lines mixed in. The rule of “more is more is more” doesn’t apply to coffee-table styling. 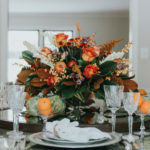 Start by placing everything you want to showcase on the table, then edit the list down to only your most cherished items. As Marie Kondo says, “only keep what brings you joy.” Once you are down to your best stuff, don’t add to it lightly. Buy the best quality you can afford. 2. Remix accessories from time to time. 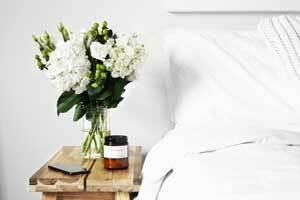 Swap out items you’ve had in another room onto your coffee table to keep things feeling fresh. 3. Go for varying heights. 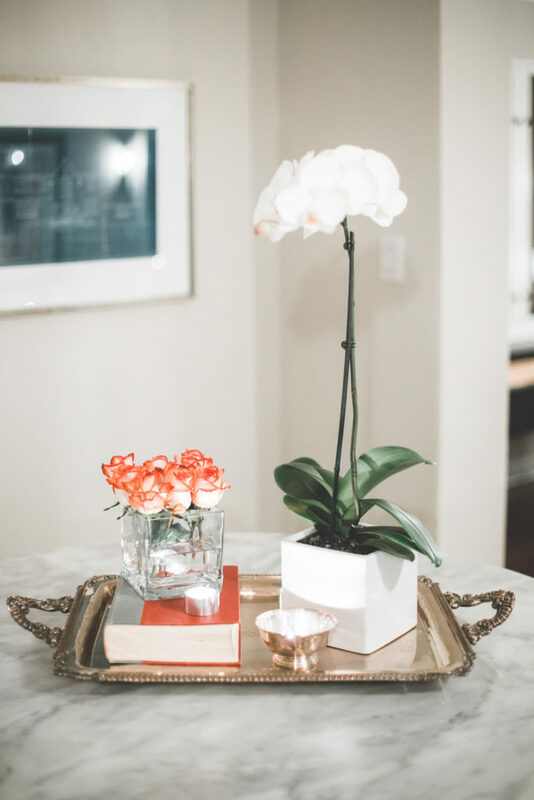 Balance a stack of large books with a small vase or candle. 4. Your guests will place a drink on every flat surface, so be prepared. Purchase beautiful, quality coasters from the get-go to avoid stressing over water marks or scratches to your table’s finish. Essex Fells is truly an incredible town, one that I am privileged to know well. In addition to gorgeous design, it is renowned for its blue-ribbon schools, amazing close-knit community, and natural surroundings. 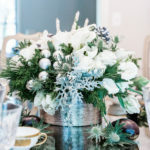 Neighbors become lifelong friends, children grow up together, and traditions are passed down, year after year. 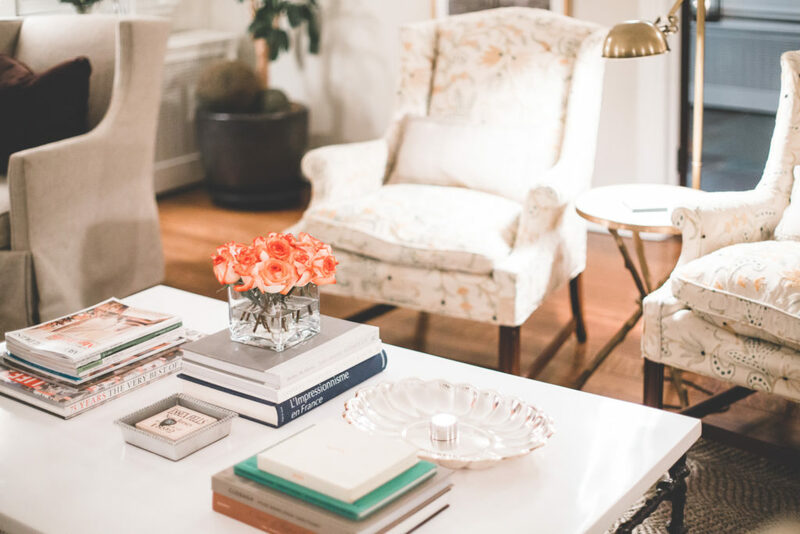 I create refined homes with an emphasis on how you want to feel in the space. Mood, texture, soul, and livability create a true sense of place.